Stand 8 - Entrance to Culver Street, once a lively street. 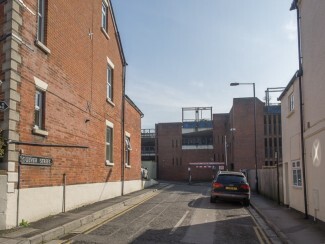 Demolished to make way for car park. Culver Street was one of the original mediaeval streets of Salisbury. In the Middle Ages, it was part of Salisbury’s ‘red light district’. It is recorded that in 1452 the women scandalised the citizenry by neglecting to wear the striped hoods prescribed as their official dress and the City Fathers ordered them out of town. By the 19th and early 20th centuries, it was a residential street, rather like Guilder Lane, complete with small shops and a pub. By the early 1970s, most of the street was demolished for development associated with the Ring Road – hence today’s dominant feature, the car park. 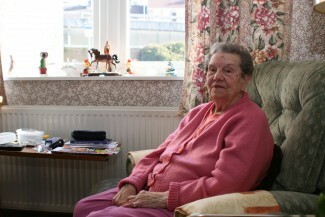 Margery Bodger, born in 1921, lived all her life in No. 40 Culver Street until it was demolished to make way for the car park. Listen to a childhood memory of her’s in the audio clip on the right side of this page or in the MP3 from the Downloads page. The only original part of Culver Street which survives today is the side entrance to the corner shop at No 68. Milford Street. Here, there was once a row of six small almshouses run by St. Martin’s Church. They accommodated six elderly women who each received a weekly gift of three shillings and sixpence from the Church. Walk on to the car park and then left round it by the tarmacked footpath. Go under the archway on your left into the car park of block of flats Nos. 12-18 Culver Street. Walk as far as the ‘No Ball Games Sign’. From here you can see the volume of traffic on the Ring Road, which occupies what was once the west side of Rampart Road. Both the inhabitants of Culver Street and Rampart Road were evicted out of the homes their families had lived in for generations, to make way for the Ring Road. 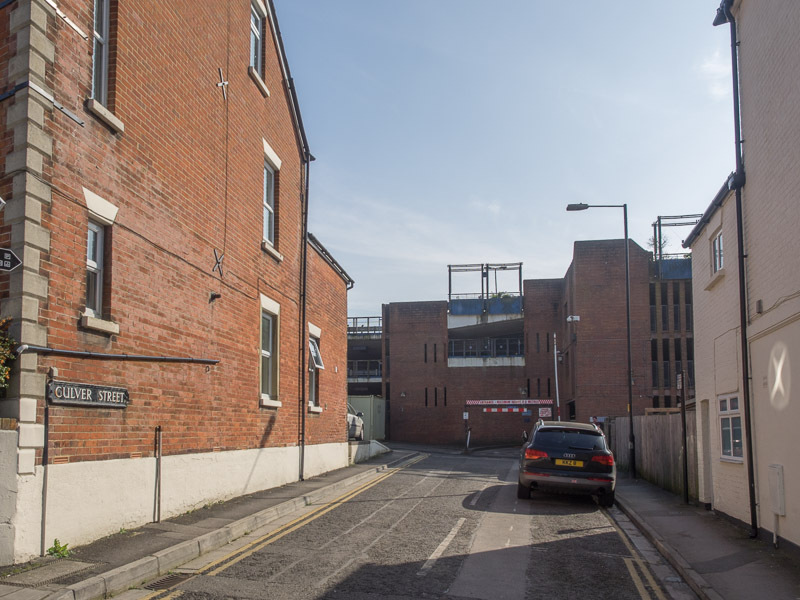 The ‘Invicta Leather Works occupied most of the space taken up by the houses on the far side of the car park It was dominated by a tall chimney and was a major Salisbury industry.There is more about this at the next Stand. Go to the end of the street to the junction and turn left into Paynes Hill and view the modern houses on your left which occupy the site of the Invicta Leather Works. There is little to see here nowadays, but the text accompanying Stand 9 reveals a little of what life was like here before these houses were built. As you entered Culver Street from the northern end, on your right was a small corner shop selling groceries, the owner of this shop was Mr Ralph. After passing a row of terraced houses on the eastern side of the street there was an arch built into the houses with rooms above it. Inside the arch was a steeply inclined roadway that led to the dairy, the larger lorries could not turn into the arch in one go and had to have two attempts at turning, the house opposite the arch bore the scars of vehicles that had failed to stop in time on the backwards roll of the turn. Early mornings in this area were very noisy with the milk floats setting off followed by lorries loaded with empty milk churns being hit by the chains that held them on. In case anybody managed to sleep through this dawn chorus, Fosters Bakery on the other side of Milford Street had a large fleet of vans that needed loading up and sending on their way. Past the dairy on the eastern side of the road was a block of six three-storey terraced houses, I lived in one of these for a few years (No. 53) the back garden was a forty five degree slope with the dairy office block at the top resembling a concrete railway carriage. Putting washing out in this house entailed taking it up to the first floor and opening the landing window which gave access to a clothes line running around a pulley and attached at the other end to a post at the top of the garden slope, the washing would be hung on the line and then fed along by pulling the other side of the line. Further along on the western side of the road was a block of comparatively new old people’s flats with an area of grass in front of them, opposite these flats was a closed down pub and a row of house, some empty and some occupied. On the corner of Barnard Street was The North rubber Co. What happened in this building i never found out but the man that ran it needed lots of cardboard boxes for which he would pay one old penny a piece. One entire school holiday was spent transporting waste boxes from the dairy to this nice man who after a week was starting to vanish behind a sea of boxes. My word I ate a lot of chocolate that week!